If I use this website rigorously and study is there a possibility to pass the class? A: Thanks to the student for bringing up this question. The editors at StudyOrgo have over 30 years of combined experience tutoring organic chemistry, so you can believe us when we say we know what we’re talking about. As tutors, students come to us in exactly this situation. These students devoted hours upon hours of studying time to this class only to be confronted with a failing grade on the exams and midterms. Firstly, you must believe you CERTAINLY can pass the course. We here at StudyOrgo are here to tell you, from experience, that it is not too late! I have personally seen individuals come from a failing grade to passing the course with just a few weeks left until the Final exam. It can be done! Even if you received poor exam scores previously, there is still time! Secondly, and most importantly, you must understand you have struggled because of HOW you have studied. We have posted a number of blog articles outlining strategies for studying for the semester and tips for when you have the “hard professors” teaching your course. Another important realization is how you got in this situation. The answer is usually one of two reasons; 1) you have missed some important concepts covered early in the semester, likely before you realized how hard this class was going to be or 2) you came into organic chemistry without a strong understanding of general chemistry. 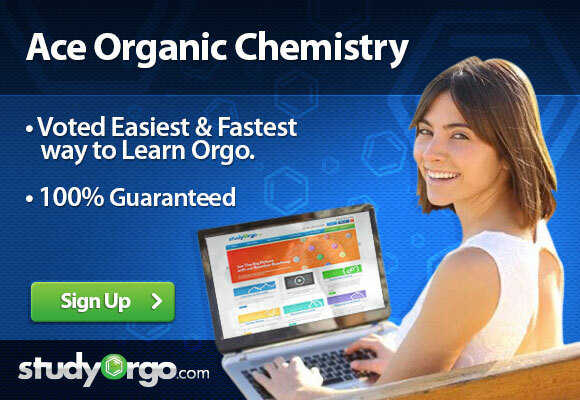 Organic chemistry is like a pyramid, the material covered from previous courses and early Orgo1 in the course (i.e. VESPR theory, hybridized orbitals, Newman projections, pKa, etc.) are critical for success in the class because not only are they tested heavily in the first half of Orgo1, they keep appearing the second half and all through Orgo2! So it becomes a downward spiral once you are missing key concepts and this is the reason for continuous struggle. But this can be fixed! The Editors at StudyOrgo have compiled all of the materials necessary for getting the best possible grade in organic chemistry. We have also distilled the information down to simple, easy to read concepts and we presented it in a clear format. We have also designed a quiz-mode for our content so as you are learning, you can check your understanding in a flash-card style to help build you memory. We have over 170 reactions commonly covered in both semesters, so be assured we have everything you need here at StudyOrgo to help get you the best possible grade. We even have a mobile app so you can view our content on the go to maximize your studying potential. Remember, we’re here to tell you it is not too late and StudyOrgo is here to help you with your organic chemistry needs!